My junior year in college, my roommate and I thought it’d be fun to have a tea party. We made cute little sandwiches, where we cut them in small triangle wedges and trimmed the crust, had different fruit bars, and of course, a variety of teas. Our friends came over and we ate, laughed, and played games. 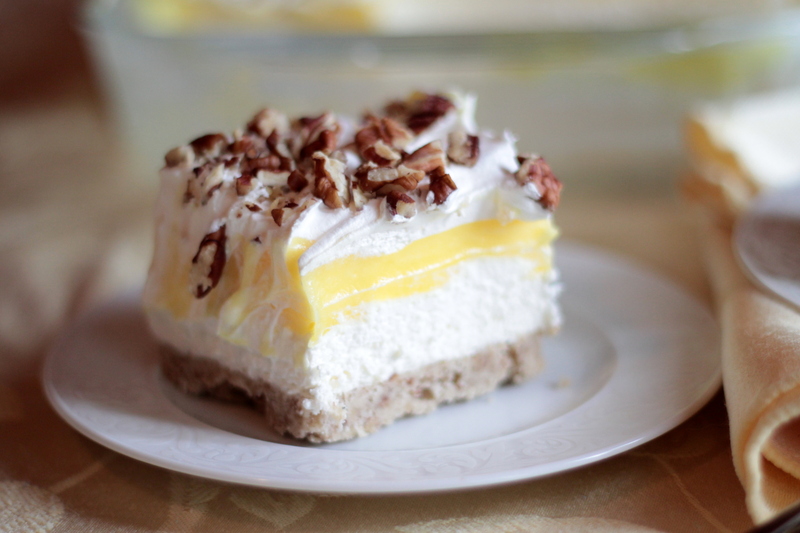 One friend brought over this delicious lemon dessert, and when the get-together was over, I asked her for the recipe. Many years later, I pulled out the recipe and tried to make it. At the time I got the recipe, I really wished I had asked her exactly how she made it, because the recipe said mix such-and-such together and bake, then add this on top, etc. It never said what pan to put it in, or what temperature to have the oven (although it did say how long to bake it), or even how exactly to mix something–which is very important to any baker. I had to improvise much, and unfortunately, the dessert flopped miserable. Fast forward eight years, and I found the recipe, tucked away amongst other long-forgotten ones. I thought I’d give it another chance. However, this time, I went the internet to see if I could find something similar, and piece together the two. P.S. 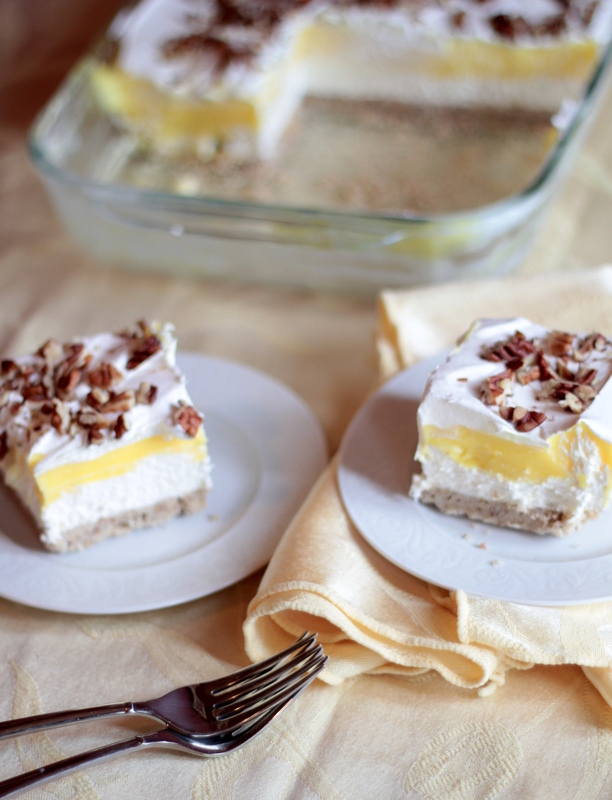 If you don’t’ like nuts, you can omit them from the top of the dessert, but I would leave them in the crust. 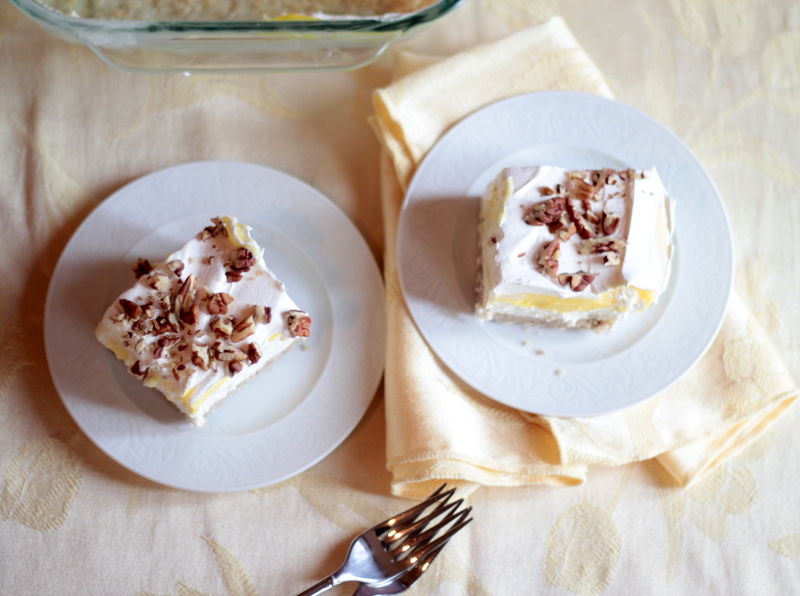 It adds a small nutty flavor which compliments nicely with the other layers. P.P.S. I’m linking this up at Add a Pinch’s Mingle Monday. Feel free to check out other fantastic desserts! Preheat oven to 375 degrees. Using a food processor, chop the nuts until really fine. Cut up the cold butter into smaller cubes and add it and the flour into the food processor with the chopped nuts. Pulse until the butter is pea-size. Press into an ungreased 9 x 13” glass pan and bake for 15 minutes. Cool fully on a wire rack. Once the crust is fully cooled, begin the second layer. Using a mixing bowl with a paddle attachment, beat cream cheese until light and fluffy. Slowly add the powdered sugar and 2 cups Cool Whip. The mixture will be thick. Add on top of the crust, getting all the way to the edges. In a mixing bowl with a paddle attachment, mix the milk and pudding on low speed for 3 minutes. The mixture will be thick. Layer evenly on top of the cream cheese mixture. 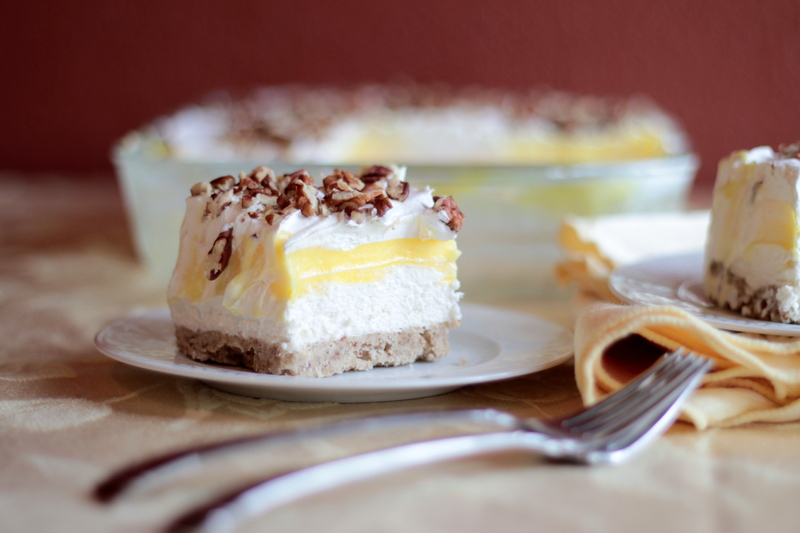 Add remaining Cool Whip over the lemon pudding and sprinkle with ½ c chopped nuts (pecans or walnuts). If you don’t like nuts, you can omit this part. Chill in the fridge about 2 hours or overnight before serving. The cream cheese package here in the States is 8 ounces, or 226 grams. So two packages would be 452 grams. Hope that helps! can’t to try this!! YUMMY!! I think I have had a similar dessert, except with chocolate instead of lemon. This sounds delicious! Omg this sounds and looks so delicious, wish you lived closer..like within the few yards so I could get a slice myself….sorry I just invited myself over, didn’t I? I love lemon desserts!!! Happy Spring.